It was a trip for all the family to the East London Design Show. The website said, “Bring the kids” so we did, and they were catered for making hats, colouring and perusing the stands. Their edit might have been different to mine. Like a magpie draw to the bright and brilliant, I honed in on the Galapagos stand. I have admired their uber-luxurious take on up-cycling before at Tent London, and there were plenty more mid-century chairs reupholstered in colourful, contemporary prints to covet at the ELDS this weekend. The founder of Galapagos, Lucy Mortimer, is on a mission to provide “high design products without the environmental impact”, and to make buying vintage furniture as accessible as buying new. The chairs are so beautifully reupholstered they look like new too. 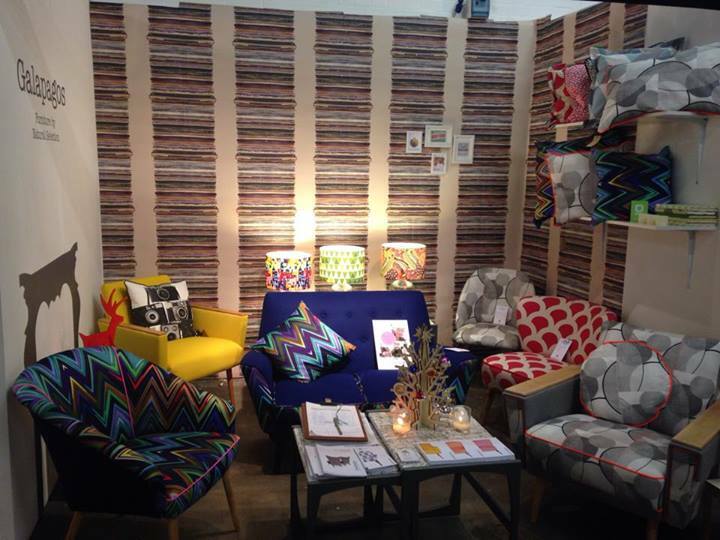 I love the latest collaboration with Parris Wakefield (thats the chevron print on the chair to the left). Re-purpose is at the heart of [re]design, a social enterprise that promotes ‘Good and Gorgeous design that is friendly to both people and planet’. Here is a picture of clocks made from playing cards, a neat re-use of that deck of cards that is missing a few. For the instructions on how to make the clock, and other things such as a pallanter (that is a planter made from a pallet, get it? ), or a bath mat from a wetsuit, have a peak in [re]craft, a book full of everyday designs to make at home, from waste. For more seasonal inspiration, try “Why don’t you…[re]design Christmas?” I can’t help having a flashback to 1980s kids TV programming…. More making good use of the things that we find, was on display with Eco-pouffe, a social enterprise. The pouffe is handmade in Shoreditch from recycled car tyres, bicycle inner tubes and legs turned from recycled timber. 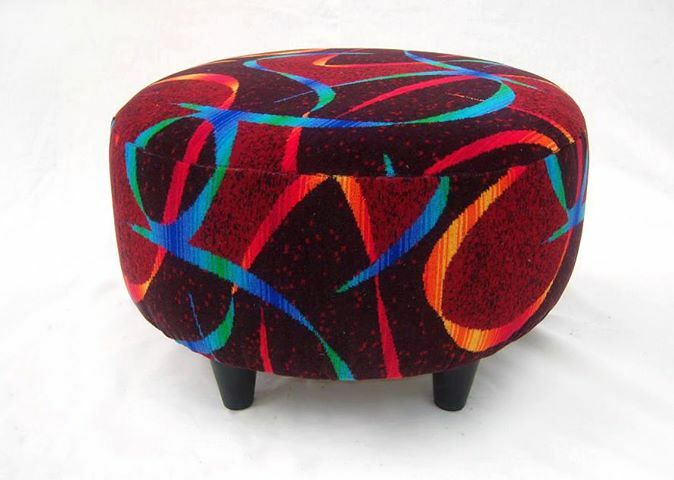 The stool is traditionally upholstered using cotton felt (a by-product from mattress-making) and covered in fabric from Holdsworth, suppliers to the Tube, or a fabric of your choice. It is certainly built to last. From London to Laos and the beautiful, subtle textiles of Passa Paa. Founder Heather Smith, a graduate of Chelsea Design School, combines traditional handcrafting techniques with innovative materials to create textiles that are firmly rooted in the patterns and symbols of traditional textiles in Laos, but re-interpreted for today. The Hmong people of Laos have long used hemp for clothing and household items. Pass Paa hand screen print the hemp with indigo and black environmentally-friendly dyes to make these stunning cushions, some of which are finished with applique work. 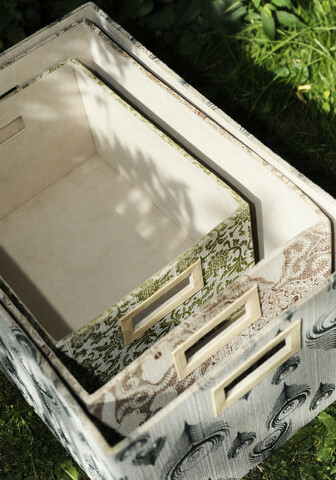 Also from the east, and drawing on traditional skills are the place mats, storage boxes and picture frames from cuvcuv. The debut collection, ‘Wild One’ is made from mendong, a rapidly renewable (growing!) aquatic grass grown in North West Java, Indonesia. cuvcuv founder, Ruth, has been working with a small family business to develop this, first range for four years. As a former buyer for Fortnum and Mason, Ruth knows a thing or two about quality, artisanal skills and provenance, and her new venture, cuvcuv is full of them. Around the corner was another new (ad)venture in renewable materials, Mind the Cork. I only had chance for a fly-by chat with Jenny Santo as the kids were hungry by this point. Suffice to say, Alice (aged 3) loved the place mats, or more specifically the holes that had been punched through the cork to create a floral design. I love cork, its look, feel and material qualities. I was all touchy, feely with the gorgeous jumpers at Monkstone Knitwear. The wool for Monkstone knitwear comes from the Monkstone flock at Trevayne Farm, a mix of Black Welsh Mountains and Dorsets. After the sheep are shorn, the fleeces are washed, and spun into yarn for hand or machine knitting. You can buy the yarn (£5 per 50g of undyed, naturally colour wool) or a delightful chunky jumper that is ready to wear. Other stands we flew by wishing we could linger longer were HAM to admire the playful, minimalist prints of a pig, horse and rabbit on 100% British homewards; and Group Design to talk about their bamboo shelves. Thanks for the compliment. I am using WordPress & the Forever theme (which is free). I find it a good platform, and am only using part of its functionality!